To that end, all of Ulfig’s installers are employees. He hires the best he can find, and he makes sure they are well trained in all capacities. Very important to him is the idea that his installers are “interchangeable parts,” as he calls them. One benefit to this philosophy is that in instances where the flooring installa­tion time is cut short, as it often is, Ulfig can flush a job with 30 employee installers and complete it quickly, meeting the deadline and thereby pleasing the contractor. As an approach to business, Ulfig has adopted the slogan, “Do it, delegate it or dump it.” That thinking applies to custom­ers as well. Standing behind their work also engenders trust. Master Craft offers a five-year labor warranty to its regular annuity customers. In addition, because Master Craft is an Installation Standards and Training Alliance (INSTALL) warranty contrac­tor and all its installers are INSTALL certified, INSTALL pro­vides a two-year warranty on its labor. Master Craft was founded by Ulfig’s father, Eugene Ulfig, and his partner James Beauchakian, known as Bo Jack, in 1974. Eugene and his partner were union installers at a firm that went belly up, so out of necessity they decided to strike out on their own. The business—then called Master Craft Carpet Service—was an installation house that did labor-only work for various design firms and dealers. Soon after, a multi-line manufacturer’s rep recruited Ulfig to call on architects and designers, an experience he character­izes as eye opening. “I saw an overview of my whole market,” he explains. “I saw where all the business was, where it could be, and how others were doing business. We kept saying [at Master Craft] that we needed to start selling material but had never done it. Dan Ulfig bought Master Craft from his father in 1994. Until the day he died, Eugene Ulfig had an office at Master Craft and received a paycheck. Ulfig participates in Starnet seminars, training and net­working events, and he currently sits on the Starnet board of directors. At one of Starnet’s Next Generation breakfast events, where seasoned members routinely offer advice to newer members, Ulfig delivered an address for which he is often known in the industry. To represent his Detroit roots, he offered his words of wisdom while wearing a crushed velvet “pimp” suit with leopard trim, leopard-print hat and shoes and gold chains, interspersing his comments with some of Motown’s greatest hits. Entry into the casino business is difficult because it requires extensive background checks of the contractor as well as its leadership. 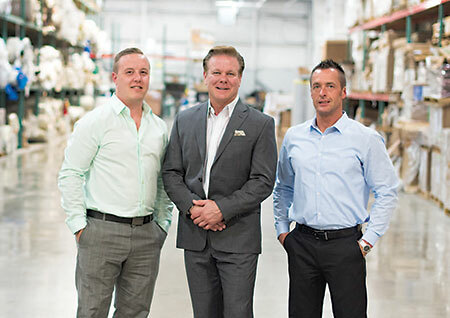 Master Craft had success getting into and working within the Michigan casino business, and when the downturn hit Detroit, early in the recession, Ulfig decided to take that experience to Las Vegas. Today, Ulfig’s son Garrett Mackey runs the Las Vegas arm of Master Craft, which accounts for about 20% of its total business. What’s more, in addition to offering floorcoverings, Ulfig has also invested in the equipment needed to polish and maintain concrete. Master Craft maintains marble and terrazzo as well. Ulfig has two sons in the business, Garrett and Ryan, both of whom work at Master Craft. He thinks a lot about what the future will hold in terms of succession, but isn’t ready to step aside yet. Most of all, he has great respect for the business that his father built and wants it to endure for years to come. Ulfig’s commitment to delegating tasks and trusting em­ployees affords him the time to have a life outside of the office. In fact, at age 53, he was the number two freestyle snow­boarder in the USA Snowboard Association’s 50 to 59 division.